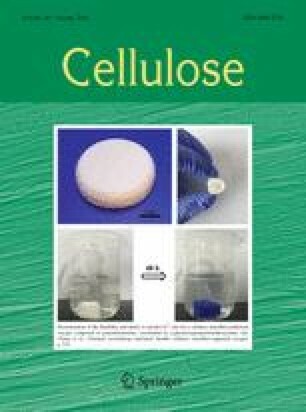 Micro and nanofibrillated celluloses are essentially one-dimensional high aspect ratio particulate materials, which can undergo two-dimensional layer (band) structuring under controlled ultralow rates of shear, typically ~ 0.01 s−1. Depending on the fibril aspect ratio this structure formation acts to develop internal strain within the gel matrix, inducing solid–liquid phase separation. By controlling the evolving rheological properties in this way, it is possible to induce significant dewatering of the otherwise strongly water holding gel, while preserving gel structure. Microscopic observation of the corresponding freeze-dried aerogels, in which the structure of the wet state has been preserved due to water removal by sublimation, suggests the formation of a close packed liquid crystal-like structuration in the case where the fibril length is sufficient to drive entanglement under axial orientation.